For grade 6 (11-12 years old), I have chosen Agentes secretos y el mural de Picasso by Mira Canion. It is an easy Spanish reader containing just 100 new vocabulary words and many English-Spanish cognates. It also repeats many key structures my students have learned over the year so it is perfect to recycle and introduce new and old material at the same time. 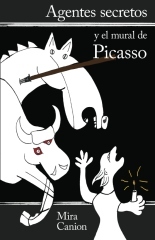 The plot is set at the 1937 International Exposition when Pablo Picasso’s mural Guernica is on display. El GUERNICA, SÍMBOLO DE UNA HISTORIA from Cristina Chinchilla on Vimeo.